Paul Ray, originator of the English Defence League, has found a new friend: Nick Greger, the German former neo-Nazi who is now a close associate of the Northern Ireland Loyalist Johnny Adair. 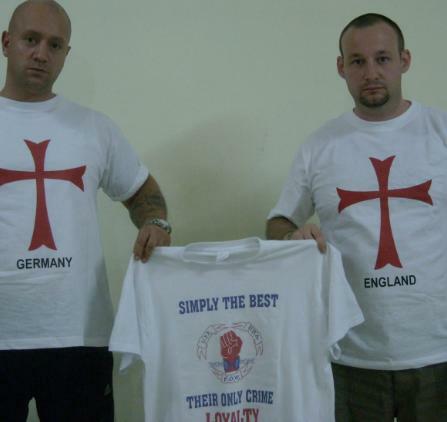 On Ray’s blog, he and Greger pose together with a t-shirt glorifying Loyalist terrorist organisations as part of a gallery announcing the launch of “The Ancient Order of Templar Knights”. Other pictures feature Greger’s Tanzanian wife (wearing a Johnny Adair t-shirt) and an unnamed black man who represents “Ghana” to match Ray’s “England” and Greger’s “Germany”. The two men also sport fresh matching Star of David tattoos on their wrists. After serving prison time for directing acts of terrorism, Johnny ‘Mad Dog’ Adair was living in exile in Scotland, forced out of Northern Ireland by his own people, when he got a message from a man he had never met: Nick Greger, the head of a neo-Nazi group in Dresden, Germany. While in prison for plotting an act of terror, Greger had heard that his idol Adair was vulnerable from attack by his enemies and organised a team of bodyguards to protect him and his family. Now, two years later, Greger has been released from prison and has big plans for himself and the man he idolises. …When Adair meets up with Greger in Dresden, the two men talk about what their futures hold. They both know that the world they knew has now left them behind, and they need a new purpose. To this end, Greger tells Adair about his new plan. He claims to have renounced his Nazi past and become a born-again Christian, and tells Adair that he had a vision telling him to go to Uganda and build an orphanage. He wants to name it after Adair’s C Company cell of the Ulster Freedom Fighters, and hopes that he will be involved in the project – but it later transpires that there may be more to his trip than helping the children and giving “something back”. The last time Greger was in Uganda, he says he was involved in arms dealing and dabbled in blood diamonds… After a few days… Greger has had to flee to Tanzania due to “problems” in Uganda – and has become engaged to a young Tanzanian woman he just met. German Nick was at one time one of the most vicious and violent Neo-N4zi’s in Germany who ended up in prison due to his N4zi ideals and “The General” Johnny Adair was one of Northern Ireland’s most infamous paramilitary leaders. German Nick has repented of his N4zi ways, has aligned himself with the Cross of Christ and pledged his allegiance to “The General” Johnny Adair. He can see clearly what is befalling his homeland, the continent of Europe and the future War that is now upon us because he clearly states that the war that is coming is a religious war between Moslems and Christians. …Mr. Adair clearly says that the last chapter of his life is yet to be written…let us hope and pray that “The General” stands behind the Cross of Christ with the armies of Christendom for the sake of the future of the civilized world. Ray’s current position within the EDL is unclear; the leaders wear masks in public and use false names, but it seems that Ray runs an off-shoot at odds with the main organisation and calling itself the “EDL: St. George Division“. He has called for a counter-protest in London for 31 October in the name of the English and Welsh Defence Leagues against a a “March for Shariah” planned by Muslim extremist Anjem Choudary, but the EDL website insists that it has nothing to do with this event and instead urges supporters to protest in Leeds. On the other hand, though, the recent interview with EDL leaders given to Martin Mawyer of the Christian Action Network was facilitated by Ray, and a recent EDL video included an image of “Crusader” graffiti taken from Ray’s blog. Newsnight ran a piece on the EDL last week, and mentioned in passing that there were rumours of overtures from Northern Irish paramilitary groups. For whatever reason of his own, Ray has now decided to put into the public domain evidence strongly suggestive that such a link is in the offing. Weren’t the Templar Knights ‘Catholics’? And here Paul Ray is holding a t-shirt praising NIRE Protestant Terrorists. While he rants about ‘Islamic terrorists’ on his bog, sorry I mean blog. “Weren’t the Templar Knights ‘Catholics’? Since when did Ray ever allow the small matter of ‘facts’ (historical or otherwise) interfere with his shameless self promotion, blatant hypocrisy and delusional fantasies? The man is clearly completely unhinged, as is vividly apparent in the final photograph of the series on his blog. Isn’t Nick Greger married to a Nigerian lady? Lol, funny to see a bunch of confused libtards here. They are all quite clearly out of their tiny minds. Paul Ray (Paul Cinato) Lionheart, is the orignal founder of EDL which when he formed this group was totally non-facist. All though Paul is very radical and fundamental in his Christian view-points, he is by no means a racist and would condone any violence. He withdrew from the EDL membership because of their connections to racist & political groups and football hooligans who make up for the hard-core majority of members of the EDL. Most of the ‘Mig Crew’ – Luton’s football hooligan firm are active members. They are the ones who have completely changed Paul Ray’s (Lionheart’s) original plans for the English Defence League as a non-racist Christian group into what it has become now – a new BNP!!! Paul Ray is now an almost universally recognised, unhinged, tiresome and tireless self publicist/attention junkie. He has disgracefully seized upon the Anders Breivik atrocity as a shameless vehicle to milk, to its fullest potential, his brief mention in passing, with regards to the tragic events, for self promotion. Predictably, he has also grasped the opportunity to yet again, direct his increasingly bizarre ravings towards those whom by which he has been scorned. PLEASE crawl back under your stone Paul Ray/Cinato and take your ridiculously inflated sense of self importance with you. You are a laughingstock.